After touring in trade shows, the Alcons Audio LR24 three way line source is finally introduced with more details. Nexo adds to its catalog the GEO M6 Series, which comprises two compact passive array loudspeakers. L-Acoustics will showcase at Prolight+Sound 2014 in Frankfurt its newest K2 line source. With Expo, an amplified portable system that is introduced at the Winter NAMM Show 2014, Fender gets into the line array world. 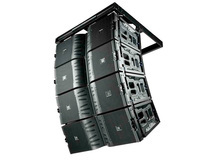 Alcons adds to its catalog the RR12 point source array, a loudspeaker equipped with the patented Pro Ribbon technology. Meyer Sound will launch in February, 2014 a new LEO Series line array loudspeaker. Tannoy announces the release of v1.25b2 update of its BeamEngine control software for the QFlex array range. Fohhn announced the availability of their new Linea LX-220 passive line array, presented in black or white finishes. DAS Audio unveiled at NAMM the new Aero 40, a 3-way powered line array with DSP delivering up to 4000W.